*Products in this post were received as PR and links are affiliate. Purchases made through these links go directly to supporting this blog. From the minute that I first saw the *Urban Decay Born To Run Palette - I knew I had to own it. In fact I already had in in two shopping carts along with one of the lipsticks and a liner, just waiting on the best deal to grab it with -- when the entire collection arrived at my doorstep directly from the Urban Decay PR team. I am on the Urban Decay PR list now and to have received the entire collection in it's entirety was absolutely amazing. When I opened this box my jaw literally hit the floor. OMG- can you say incredibly grateful? I don't receive a ton of PR so to have been put on the list of one of my very favorite brands, is indeed, quite humbling. But do know that you will always get an honest review from me and that even when I don't get something sent to me from UD that I am interested in it, I will purchase it myself. This will NEVER turn into a PR only blog. The Born To Run Collection consists of the Born To Run Eyeshadow Palette, three lipsticks, three 24/Glide On Pencils and a travel-sized All Nighter Spray. This entire collection has my name written all over it. Everything from the palette, to the three liners, is exactly my style and I still can't believe that I now own the entire collection. I don't want to spend a lot of time on the packaging of this palette because I tend to go on about packaging all the time-- but I love the direction they took with this collection. I really like the travel theme and the photos on the packaging, plus I love the sleekness of this palette. UD is known for making some pretty cool palettes (think the Alice in Wonderland palette, which I do own), but sometimes they can get bulky and be hard to store. This palette is nice and slim and has no wasted space at all. The most important piece in the collection has to be the Born To Run palette. I own quite a few Urban Decay palettes, but this has to be one of the most exciting ones I've ever seen UD put together. The mix of neutrals, with a few pops of color, including an area of the palette that contains lots of shades to create a smoky eye, is just perfect. I think one of the best things about this palette is the incredibly versatile color scheme. You really can create everything from an everyday eye, to an evening smoky, sultry look. I tend to get overwhelmed with palettes that have a lot of eye shadows, there are so many sitting in my collection that I never touch because from the minute I open them, I've got no idea what to do. That doesn't happen with this one. I think it's because I love so many of the shades in this palette, that instead of overwhelming me it actually really inspires me. For me the best part of the palette has to be the metallic shades, which have worked perfectly for me with a brush and without having to wet them. I've never been one to wet shadows so I love that the shimmer metallics in this palette work so well and are so high impact on their own. My favorite shades are: Wanderlust, Radio, Smog, Drift and Double Life - with Wanderlust being my #1. The matte shades are also really solid. They perform well and have nice pigmentation, especially Hell Ride which really surprised me with the amazing color pay-off. Still Shot and Baja are two other mattes that are also really nicely pigmented, and I love using Punk on almost all my looks. While the top row of this palette is not the most exciting, at least to me, I have found myself reaching for shades in this row a lot, Riff especially. I've even used Stranded which is a light gold, super strange because gold shadow is usually not my jam but this shadow is super pretty (you can really see how reflective it is in the swatch above). Do you see how amazing these metallic shades are? I have many of Urban Decay's palettes and I don't think they've executed such incredible metallics in any other palette, at least not consistently. Usually a palette will have a few really stellar shimmer/metallics, but the ones in this palette are really great quality across the board. I've now been using the Urban Decay Born To Run Palette for over 3 weeks and it's actually surpassed my expectations. I knew that I was going to live for the dark metallics and could not believe that they had included THE PERFECT GREEN SHADOW, but I am enjoying the rest of the palette as well. In almost every palette I own, I tend to stick to a certain section but I have been dipping my brush into this entire palette and really playing with different combos. As for the cons of this palette: the price is high, but consistent with a palette that contains 21 shades. In fact you get a lot of product for your money. The only thing that I could say would be nice to have is a cool toned transition shade, so I wouldn't have to use Riff each time. But that is the only con I can think of. 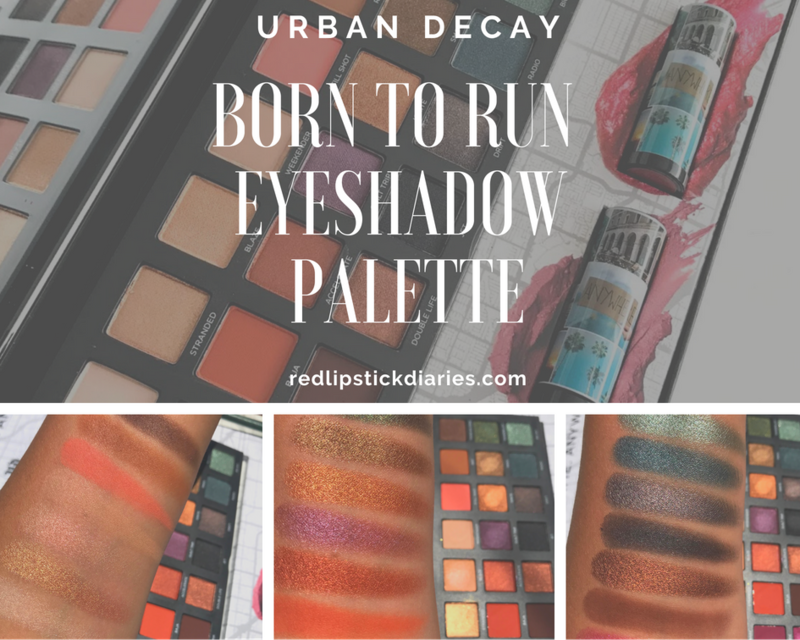 Is the Urban Decay Born To Run Palette worth the hype? I definitely think so. I am enjoying this palette so much that if it was limited edition I would be thinking, backup. I do own quite a few UD back-ups and this palette would be getting one too, but I don't believe it's LE so I can just wait to buy another in the future if I should ever need it. I love this palette, end of story. Buy this palette along with the rest of the Born To Run Collection at Sephora, Ulta or Nordstrom. *Products in this post were received as PR and links are affiliate. Purchases made through these links go directly to supporting this blog. Thank you in advance if you decide to support my blog with your purchases.